Cuban Grandmaster Lenier Domínguez Pérez (right) won the title with a dominating performance of 11.5/15. While not the favorite in a powerful field, it is not surprising that Dominguez had a good result. Cubans are typically fond of blitz and Dominguez showed his strength by conquering a field including: Vassily Ivanchuk (2787), Alexander Morozevich (2787), Peter Svidler (2727), Alexander Grischuk (2719), Teimour Radjabov (2737) and Shakhriyar Mamedyarov (2731). Gata Kamsky also took part as well as Judit Polgar who came in a disappointing last place on 2.5/15. Egypt’s Bassem Amin (2560) got 4/15. A record-breaking tournament will occur in Dresden as 154 men’s and 116 women’s teams will participate in the world’s premier team tournament. The Chess Drum will be in Dresden starting on 20th. More details to follow! 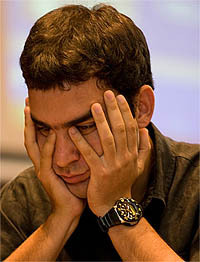 Not sure why the author of the ChessBase article stated that Lenier Dominguez was victorious over the “big boys” when at 2719 he is one of them. If Bassem Amin had won, it would be appropriate. They also said he won over “Russian-speaking” players. I suppose there is still the tendancy to put Russia in the center of the chess world. By all indications, those days are over. I’ll make my Olympiad predictions tonight! How come I didn’t see Nakamura name on that blitz tourney list? Are they afraid to invite him? Maybe his schedule won’t allow it. Sorry to Judit Polgar in last place but she doesn’t play that much anymore, so I figured she be quite rusty. Good question. I may ask him that question in Dresden. Here are my predictions.